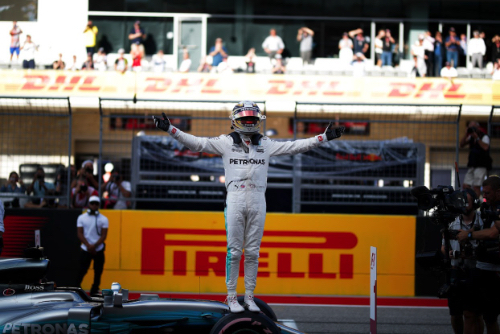 By winning the pole for the United States Grand Prix, Lewis Hamilton completed his clean sweep of practice and qualifying. Not only was he fastest of all in the third segment of qualifying to cement his 72nd F1 pole, he as also quickest in FP1, FP2, FP3, Q1 and Q2. "Yee hah!" he said. "The track was very difficult with the wind picking up. It is shifting the whole way through the lap. But that is why I love this track, especially when you have a good car." The lineup for the weekend was: Mercedes - Hamilton and Valtteri Bottas; Red Bull TAG Heuer - Daniel Ricciardo and Max Verstappen; Ferrari - Sebastian Vettel and Kimi Raikkonen; Force India Mercedes - Sergio Perez and Esteban Ocon; Williams Mercedes - Felipe Massa and Lance Stroll; McLaren Honda - Fernando Alonso and Stoffel Vandoorne; Renault - Nico Hulkenberg and Carlos Sainz; Toro Rosso Renault - Daniil Kvyat and Brendon Hartley; Haas Ferrari - Romain Grosjean and Kevin Magnussen; Sauber Ferrari - Marcus Ericsson and Pascal Wehrlein. A number of drivers had grid penalties for assorted power unit changes. Vandoorne would move back five places; Verstappen 15; Hulkenberg 20; and Hartley 25. Hamilton was fastest in FP3 with an unofficial track record 1:34.478. The ambient temperature at the start of qualifying was 88 degrees Fahrenheit (31 degrees Centigrade) and the track temperature was 100 degrees Fahrenheit (38 degrees Centigrade). Pirelli's tire compounds were the ultra soft, super soft and soft slicks. Naturally the smaller teams sent their drivers out on the ultras while some of the bigger teams opted for the super soft tires for the first runs in the 18-minute Q1. Bottas was in the latter group when he went to the top with a 1:35.309. Soon less than three minutes remained, and only the 10 top drivers remained in the pits. When it was over, the five drivers who were eliminated at the end of Q1 were: Ericsson, Stroll, Hartley, Wehrlein and Magnussen. The fastest 15 drivers who moved on to Q2 were: Hamilton, Verstappen, Bottas, Vettel, Sainz, Massa, Raikkonen, Alonso, Hulkenberg, Ocon, Ricciardo, Kvyat, Vandoorne, Perez and Grosjean. Would anybody gamble on using the ultra softs for the 15-minute Q2? Not the pace setter Hamilton who turned a 1:33.560. Nor Bottas who was 0.233 of a second slower. But Verstappen went for the super softs. No doubt saving new ultras for the race when he would have his penalty. All the rest were on the ultras. At the front were Hamilton, Bottas, Vettel, Ricciardo, Raikkonen, Verstappen, Ocon and Perez. Massa was on the bubble in 10th with Sainz ninth an Alonso 11th. Once again the last three minutes saw a lot of action. The five drivers who were eliminated at the end of Q2 were: Massa, Kvyat, Vandoorne, Grosjean and Hulkenberg. The latter had done no laps so as to save the engine. The fastest 10 drivers who moved on to Q3 were: Hamilton, who got down to a 1:33.437, Bottas, Raikkonen, Vettel, Ricciardo, Verstappen, Perez, Sainz, Alonso and Ocon. Q3 lasted 12 minutes. And it was ultras all round of course. Hamilton posted the first fast time: 1:33.108. Bottas was 0.460 of a second slower with his 1:33.568 but still second ahead of Raikkonen and Vettel who did 1:33.852 and 1:33.867 respectively. Verstappen, Ricciardo, Ocon, Alonso and Perez rounded out the top nine followed by Sainz who did not go out. And then it was time for the last three minutes of Q3, and all 10 drivers were in action. Vettel did a 1:33.347, moving to second. Hamilton did a 1:33.229 so did not improve, neither did Bottas who was now in third. Ricciardo moved up to fourth when it counted. Raikkonen was fifth ahead of Verstappen, Ocon, Sainz, Alonso and Perez. Hamilton's clean sweeper of the two days was complete. Now he had to add Sunday's race to the list. "It's going to be a great race," he said, "it is going to be a tough one."